Questions have emerged over whether Paula Broadwell, David Petraeus’ mistress, leaked details of the CIA’s investigation into the deadly attack on the U.S. consulate in Benghazi. Suspicions over how much Paula Broadwell knew about the probe come as the CIA’s former boss stepped down on Friday over the alleged affair, days before he was to testify in the investigation. Officials say they expect he will still testify over the incident, which left four Americans dead on September 11 this year, yet it will be delayed. The new concern comes over what, if any, confidential information he shared with his biographer and alleged mistress. Paula Broadwell, a married army veteran who met David Petraeus in 2006, was speaking at the University of Denver on October 26 when she was asked about the attack. “Now I don’t know if a lot of you heard this, but the CIA annex had actually – had taken a couple of Libyan militia members prisoner and they think that the attack on the consulate was an effort to try to get these prisoners back,” she said, according to the Daily Beast. In response, the CIA denied that claim on Sunday when the tape of Paula Broadwell’s talk surfaced, saying that it was not true. The agency confirmed that since 2009 they have not had the authority to detain prisoners. “Any suggestion that the Agency is still in the detention business is uninformed and baseless,” they told the site. 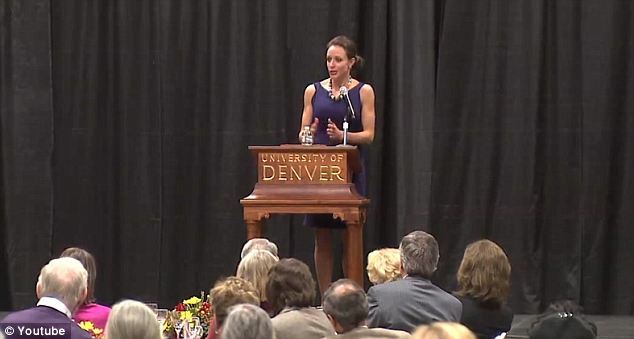 The only other news station to report that claim at the time that Paula Broadwell made her speech to the University of Denver was Fox News, which she references moments before making the claim about the alleged prisoners. According to the clearest timeline of Paula Broadwell and David Petraeus’ alleged affair, which is said to have started in 2011 and ended in “early summer” of this year, they would have been broken up for at least a few months by the time of this conference. She went on to defend both the government’s controversial reaction to the crisis and the CIA’s lack of disclosure. “The challenging thing for General Petraeus is that in his new position he is not allowed to communicate with the press. So he’s known all of this, they had correspondence with the CIA station chief in Libya. Within 24 hours they kind of knew what was happening,” she said. “If you remember at the time, the Muslim video, the Mohammed video that came out, the demonstrations that were going on in Cairo- there were demonstrations in 22 other countries at the time, tens of thousands of people and our government was very concerned that this was going to become a nightmare for us. “So you can understand if you put yourself in his shoes, or Secretary Clinton’s shoes, or the President’s shoes, that we thought it was tied somehow to the demonstrations in Cairo. It’s true that we have signal intelligence that shows the militia members in Libya were watching the demonstrations in Cairo and that did galvanize their efforts. Paula Broadwell has come under intense scrutiny ever since David Petraeus, the four star general credited with the surge in Afghanistan, submitted his resignation citing an extramarital affair. During the lengthy discussion, Paula Broadwell’s high aspirations are clear as she spoke repeatedly about how she has had the life-long goal of becoming the National Security Adviser. When asked if she had the chance to talk to any previous NSA’s, she said that she had not but she considers “Maddie” and “Condi” to be great role models, referring to Madeline Albright and Condoleezza Rice by their nicknames. Paula Broadwell’s high achieving personality and her unusually comfortable nature around David Petraeus raised concerns among Petraeus’ close advisers in the year leading up to the revelation of the affair. To those outside the general’s tight-knit circle, however, news of the affair came as a big surprise when it was announced on Friday. David Petraeus was expected to make headlines when he was made to testify in front of Congress about what and when the CIA knew regarding the timeline of events in Libya when a group of terrorists stormed the consulate killing ambassador Chris Stevens and three other Americans. The affair was discovered by the FBI when they responded Jill Kelley, a Florida woman and friend of David Petraeus who allegedly received email threats from Paula Broadwell. Both Jill Kelley and Paula Broadwell are married with children, but that didn’t stop Broadwell from becoming defensive of David Petraeus. Paula Broadwell supposedly told Jill Kelley to “stay away from my man”. Though there were multiple threatening emails, none of them were considered criminal so the FBI has not charged the army reservist. News of the affair “was like a lightning bolt”, said Democratic Senator Dianne Feinstein who heads the Senate Intelligence Committee. David Petraeus was scheduled to testify in front of Congress on Thursday, but that has since been pushed back in light of his resignation. Now his replacement, CIA deputy director Michael Morell, will appear instead of David Petraeus. Dianne Feinstein went on to say that just because David Petraeus no longer works at the CIA, that does prohibit Congress from compelling him to testify about Benghazi at a later date.